Let's start this post by saying I hope everyone had a fun Halloween! At hour home, my husband and I enjoyed handing out candy and taking in all the great costumes in our absolutely Halloween crazy neighborhood. In an hour and a half, I was out of over $50 in candy!! However, the night was sort of sad too, because this was the first year neither of my boys went out! On the upside I got to eat candy without abandon. Or on the downside, depending how you look at it. So onto my review. 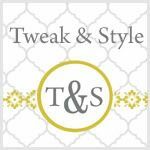 As a blogger with a business specializing in furniture revivals, I really want to give my audience great information and resources for doing furniture makeovers. So, I thought I would start by reviewing products I use regularly and those that I am experimenting with. Hopefully, my experiences can inspire you… or at the very least save you some grief!! 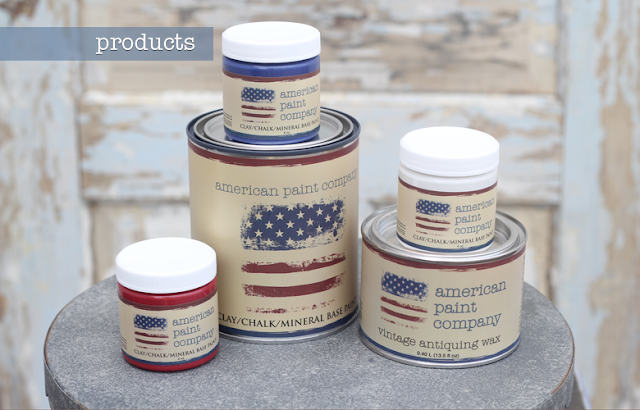 My first review is of American PaintCompany’s (APC) chalk paint and wax. In this post, you can read about the first piece I finished with APC. Now let me tell you, Annie Sloan ChalkPaint (ASCP) will probably always be a first love, but I like to experiment. So, after completing many projects using ASCP, my eyes started to wander to other color palettes and I started to wonder how other brands of paints might perform. 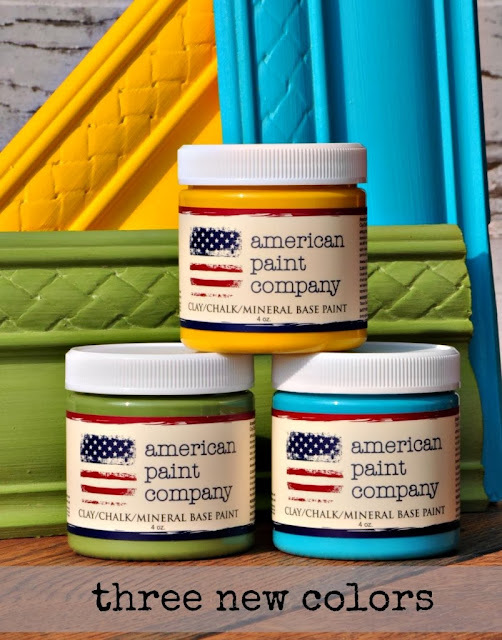 The first new product to catch my eye was American Paint Company’s chalk paint. This company offers a range of products, including chalk paints, waxes and some specialty products. What really excited me about this company was that their products are all natural, zero VOC, eco-friendly and solvent free paint… and they are American made. After logging onto their website, I discovered a site that was user friendly and offered a ton of easy to find advice and tips on their products. After reading up on the products, I visited the link to my nearest retailer and ordered a selection of paints and waxes for my next project. This ordering experience started my APC relationship off to a great start. Like most moms and bloggers, I was catching up on business later at night when the family has finally settled down. I emailed Donna at Painted PastDesigns with questions about my selections and the company, expecting to hear from her the next day. Within minutes she got back to me to answer my questions! She was sweet and helpful and it made me even more excited to try the products. When my products arrived, it was like Christmas and she even threw in a Painted Past Designs wax brush for me...now how nice it that!! The colors I selected were Rushmore, a light warm stone color, Navajo, a beautiful crisp white and the dark and light waxes. I ended up just using the Rushmore color on my dresser. Like ASCP, there is no priming necessary although the company recommends lightly sanding shiny pieces on their website. The ACP paint seemed thicker to start out with then ASCP, but it can be thinned with water, which I generally also do to ASCP. The feel of the APC paint was drier and rougher than ASCP. I would recommend thinning the APC paints with water especially on your second coat for the smoothest results. I was also able to sand it easily to soften brush strokes and it did not leave a sheen difference. I feel when I sand ASCP it can leave a different sheen between sanded and un-sanded places. This was completely uniform. I also felt like the adhesion was excellent…like I had covered the pieces with cement. It wasn't going anywhere. Ok now, this was the hands down best. First off, there was no odor, at all! It was also sooo creamy. Easy to apply and again, I feel like with ASCP wax, you have to really apply evenly to not get stroke and sheen differences. This was really forgiving and left a nice finish that wasn’t tacky. My only warning, when I first applied the wax over my Rushmore, it looked like this. Initial application of APC wax…do not freak out at this point, it will dry normal! I knew wax could make paint darker, but this was crazy, dark and streaky and it seemed to really soak up in places. Well, I almost freaked out, but hey its only paint. I waited and I maybe emailed Donna at Painted Past Designs a little panicked and I was reassured it was ok. And low and behold, it dried beautifully, hard and not tacky. Again...let's not forget what it means to have someone representing the company to be there to help you...outstanding customer service. 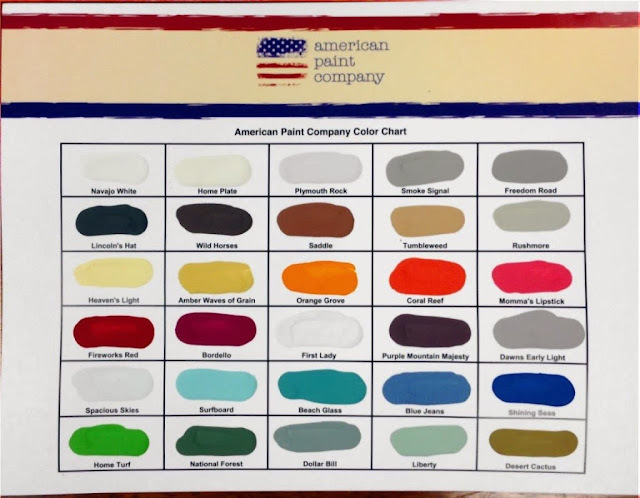 Here's a rundown of American Paint Company products and a highly recommend trying it on your next piece. From their website, “The original chalk and clay base paint, American Paint is thick, rich and self-priming. It provides superior coverage. You can thin it to your liking or use it straight. No-odor, non-toxic and with No VOC’s – every option offered is a breathable healthy alternative to other products on the market today”. APC has a pallet of 33 colors after just introducing 3 new colors. The colors have a beautiful range of soft and earthy neutrals and some very fun and vibrant shades. More vibrant than ASCP. My favorites so far are Rushmore, Navajo White, Beach Glass, Lincoln’s Hat and Amber Waves of Grain. And breaking news! A new color pallet is being announced in a couple of weeks. French/European inspired, but American focused. It's called The Ellis Collection (Ellis Island). Be prepared by a little a product that seems a little more “raw” than ASCP and this is because this is all natural. The product does finish out to a smooth lush finish. Some lighter colors seemed to take more coats and I recommend thinning finishing coats. From the company’s website, “American Paint Company waxes create a dirt and dust resistant seal that buffs out to a lustrous finish. The Vintage Antiquing Wax can be applied directly to the dry paint without the need for clear waxing first. No oily staining or sticky residue. It dries quickly and will buff out beautifully”. The waxes are fabulous products and right now they are my go to wax. And yes, you read it right. You do not have to use clear wax before the antiquing wax! Now that right there is furniture refinishing awesomeness. The healthy, no odor and great performing wax. The informative and friendly website. Have any of you tried APC products? If so, I'd love to hear your experiences! This post is so comprehensive and informative - it's great! I haven't used ACP before, but now if I try it out I'll feel very prepared :) Thanks! thank you for this info, you explain things very well and I like your work. I will order from them and give this a try. I basically had the same experience when I ordered my product from APC. The customer service was exceptional. I do love me some great customer service! I love the product for the same reasons, although I was a bit concerned with the feel, I got over it when I could wax without pre-waxing. It's a really good product to add to my paint stash. Which has become a small paint store, if you listen to my friends! 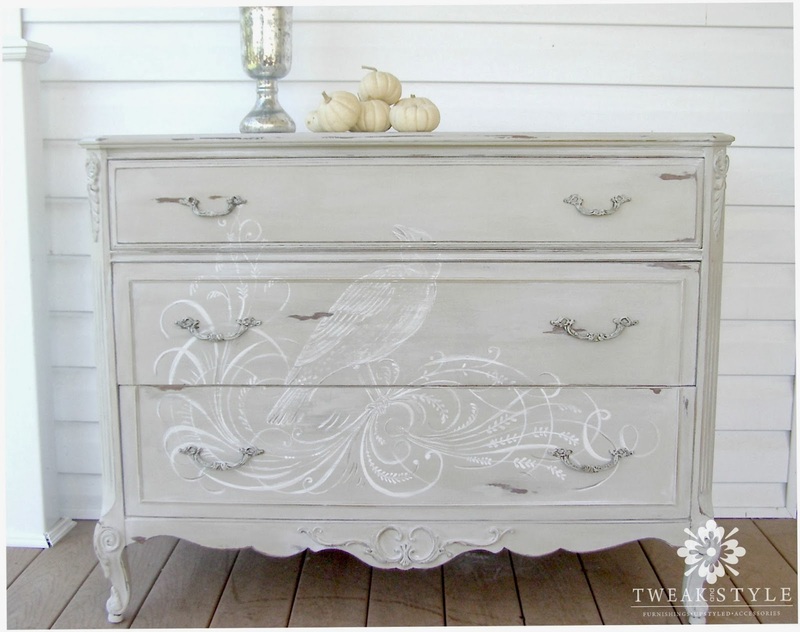 I've never used chalk paint before at all, so this was very helpful. I'm looking forward to your future reviews! So.......With APC as your go to wax, do you use this wax on the annie sloan paint? Let me know! I love reading your blog. I just started blogging in November. I've been redoing furniture for a long time too. Love your thoughts! Great post – thanks for all of the information! Great review! Thanks for taking time to do such an awesome comparison! I just finished a night stand in dollar bill and i loved working with this paint even more then ASCP! But i waxed it in ASCP clear wax and it did not dry even! It looks hideous! now im trying to fix it and having no luck! Did it dry blotchy and ugly because i used the ASCP wax? Help!!!! My little sister is getting huge into painting and wants to paint her own furniture. We have been trying to find her some paint products for her birthday coming up here soon, but we have no idea what to look for. This helped though and I hope that we can find some stuff that she would really like soon.